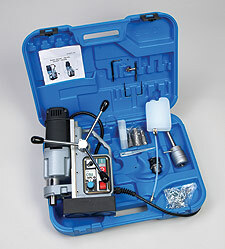 Portable Magnetic Drills – CSU 50RL Reversible motor for drilling and tapping applications – holes up to 2 ” dia. Model CSU 50RL has a reversible motor for drilling, tapping and countersinking applications. Standard equipment includes auto lubrication, auto chuck cutter holder, 1/2″ geared chuck, safety chain, carabin hook, allen keys, pilot pins and carrying case. 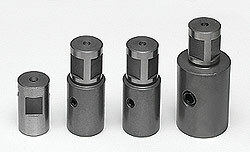 Tap collet set included with model CSU 50RL. Twist drill capacity up to 7/8″ dia. • Lightweight and portable at 29 lbs. • HD dual-coil magnet has holding strength of 3750 lbs. Twist Drill Capacity: 7/8″ dia. Magnetic Force (1″ Plate): 3750 lbs. With a 3/4″ chuck (Part No. 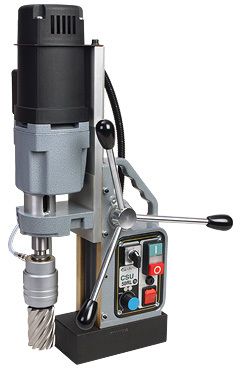 IBC 22) or MT2, these models easily convert to standard drill presses with a 5″ stroke for conventional twist drills. Optional quick-change tapping chuck with MT2 connection (Model GSW.222) has flexible collet to fit taps 5/16″ to 5/8″.